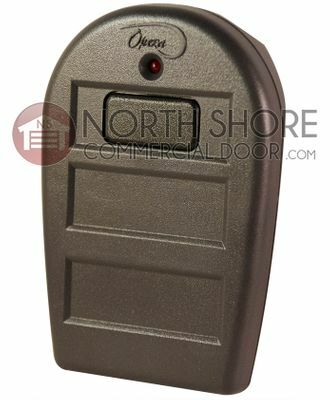 For top brands in garage door opener remotes for your commercial or residential gate or garage door operator, trust the pros at North Shore Commercial Door. We have Chamberlain garage door opener remotes that are compatible with LiftMaster, Craftsman and other brands of operators and receivers. Shop our line of garage door remotes by Genie, Stanley and other leading makers of home, small business and industrial garage door opener remotes. If you need a remote for your LiftMaster 8500 jackshaft opener, we have it in stock and ready to ship. Remote control transmitters allow you to control open, close and stop functions on your garage door without having to use a key or entry keypad. Remotes with visor clips and key rings allow you to operate your remote control from inside your vehicle. Replace a nonworking remote, or order a remote to have on hand as a garage door opener device in addition to your keypad and keys. In addition to our wide selection of brands, each remote offers unique features. Some remotes have multiple buttons to control multiple operators, while others include special add-ons such as built-in LED flashlights. The remotes typically include a visor clip or keychain connector to keep your transmitter handy whenever you need it. Confirm compatibility with your gate or garage door opener by using our downloadable product manual, consulting your opener manual or contacting our staff.